Amy Frost submitted this one. 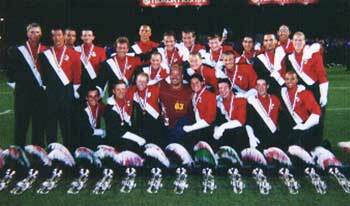 "This is a picture of the 2003 Santa Clara Vanguard trumpet section. In the center is Mark Whitlock, one of the brass staff from this past season. That's me to the left of him. It was a great summer and I loved every minute of it! Thanks!" Thank you Amy!